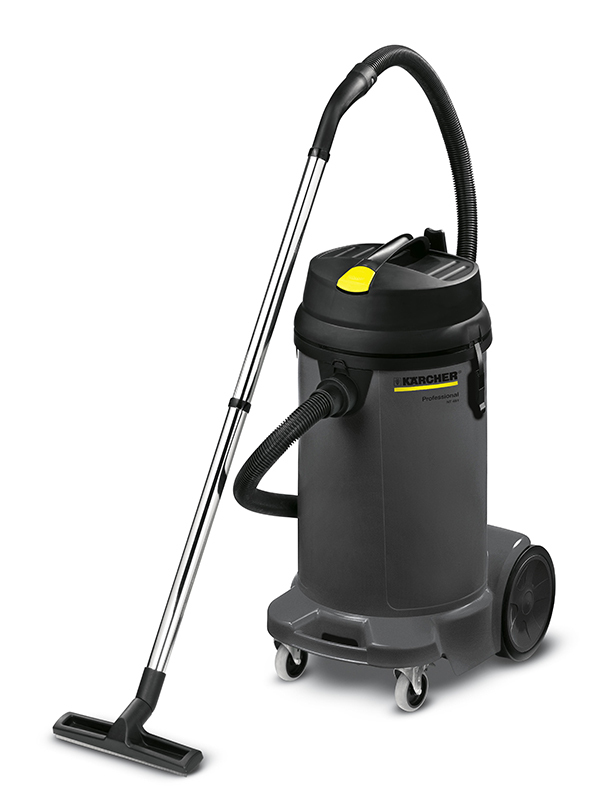 This machine is a very robust, functional and powerful wet/dry vacuum cleaner with optimal ergonomic properties, by compact construction, which is developed for the specific needs of contract cleaners, automotive-area and trade. The NT 48/1 has a container capacity of 48 l. The machine is equipped with an integrated cable hook and an accessory storage for suction tubes, floor tool and crevice tool. The large cartridge filter with the huge filter surface (0,8 m²) provides a constant high suction power of the machine. The reliable float system provides a safe interruption of the air flow by all absorbed fluids. At any time tools or other implements could be stored ready to hand on the large storage area on the turbine head. Through easily accessible drain hose, sturdy chassis with big wheels and castors made of metal with fixing brake and integrated recessed grip at the container a comfortable transport is enabled. Developed for the specific needs from contract cleaners, automotive-area, trade and commerce. - Large rear wheels and castors provide high stability and easy transportation. - Robust design because of a sturdy bumper. - Large-area cartridge filter for constant high suction power and long periods of use without interruption. - Fast, safe liquid disposal with built-in drainage hose. - Storage of the machine is made easy due to the built in cable hook and on-board accessory holder.